« Gartner classifies ECGridOS as 'cool' – that's cool! Well, it’s time to update this post – ECGridOS has now been in daily use by several serious B2B service providers since 2010 – continually growing its library of functions . And, the ECGridOS API now has AS2 functionality, in addition to offering message VAN routing. ECGridOS now comprises over 150 functions, granting complete network control to B2B programmers, integrators, and software OEMs. 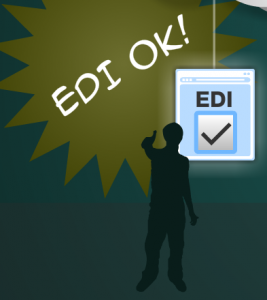 The fictitious EDI Guy in the upcoming final ECGridOS video, shepherds B2B companies across the gap of becoming their own EDI network with ECGridOS. The SAAS B2B company transitions from a consumer of EDI Communications to an integrated operator of their own EDI network. The ERP vendor transitions from adding EDI communications at the end of project integration, to offering built in EDI Communications. “But ECGrid® and the API (ECGridOS) have Globally Routed Connections”, and, the companies that are bleeding money with in-house AS2 and FTP, struggling with trading partners and vendor support (not their core business at all – neither are they VAN fans), go with Edison’s suggestion to “get a supply chain, that isn’t a pain in our pocket” – they end up making money by transitioning from self hosted AS2 (dead end connections) to a hybrid system that suppors VAN routed EDI and AS2 instant, virtual hubs. Your trading partners will thank you – you are your OWN EDI network, with ECGridOS ! More importantly, our partners have real skin in the game, and are building ECGridOS into their products. It is gratifying that these companies, some quite prestigious, are placing a marker on ECGridOS, making Loren Data Corp more than an alternative to other commerce networks, but making us an integral part of their very product road map. This entry was posted on Wednesday, May 12th, 2010 at 10:51 am and is filed under blog, eRP, Multi-Tenant. You can follow any responses to this entry through the RSS 2.0 feed. Both comments and pings are currently closed.